Cultivated carrots originated in the Afghanistan region and were at that time, yellow and purple. From this center of domestication carrots they were grown as a root crop to the East and the West with the incorporation of several characteristics contrasting the environmental conditions appertaining to two geographic regions. The Eastern carrot spread to central and north Asia and then to Japan. Red coloured carrot is typical for India and also was introduced to Japan. In contrast, Western carrot type is characterized initially by yellow and later by orange root colour. 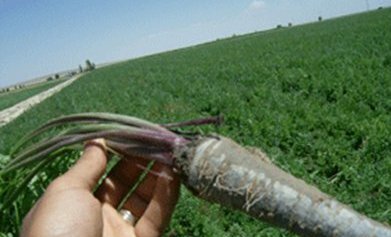 This carrot type spread to the West and now dominates in carrot production around the world. The Black carrot plays an important role in human nutrition, as it comprises a variety of health promoting components (Suzme, Boyacioglu, Toydemir, & Capanoglu, 2014). In addition to the presence of known antioxidants such as vitamins C and E, black carrots have also attracted attention due to the presence of phenolic compounds, which contribute significantly to the antioxidant capacity (Algarra et al., 2014). Besides anthocyanins as the major phenolic compounds, it has been shown that black carrot also contains significant amounts of phenolic acids, including hydroxycinnamates and caffeic acid (Kammerer, Carle, & Schieber, 2004). 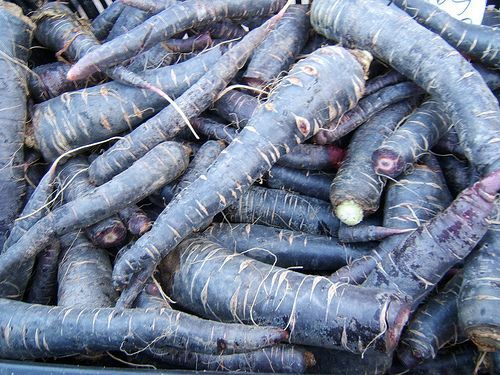 Black carrots are perishable and difficult to preserve as a raw product. Therefore, black carrots grown in Turkey are often processed into different products such as juice, concentrate and Salgam – i.e., a traditional lactic acid fermented beverage – (Turkyilmaz, Yemis, & Ozkan, 2012). Black carrots are also an excellent source of anthocyanins. Anthocyanins help lower bad cholesterol (LDL) along with helping protect the arteries against oxidation. Anthocyanins also help protect us against various forms of cancer. This variety has high nutraceutical values and is rich in anthocyanins, phenols, flavonolds ß-carotene, calcium, iron, and zinc. Its anti-oxidant activity is four times higher than red carrot. The fresh black carrots are suitable for salad, juice, pickle and kanji which are good appetizer. 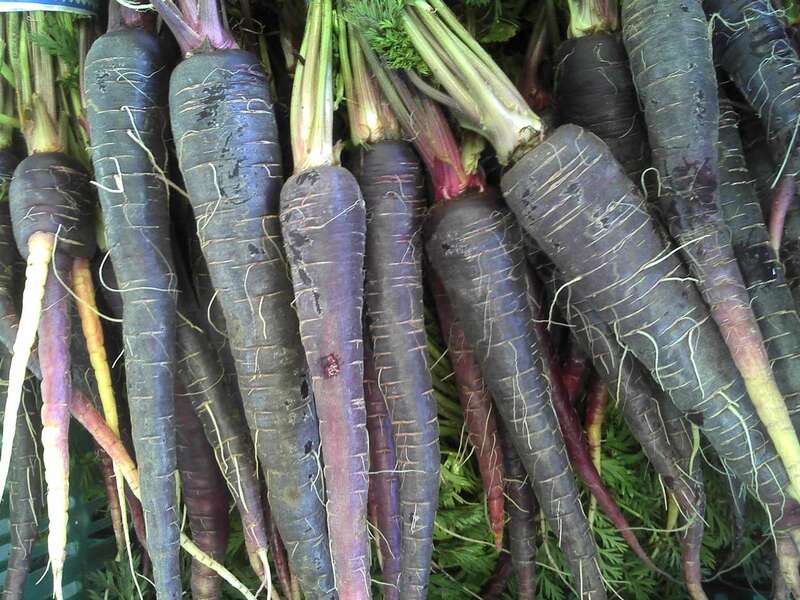 See also the famous, unique, purple/black carrots of Cuevs Bajas, Spain, here. The “Journal of Agricultural and Food Chemistry” published a study in April 2011 that investigated the anthocyanin content in four varieties of black carrots including the Antonina, Beta Sweet, Deep Purple and Purple Haze and found a range of anthocyanin levels, from 1.5 milligrams per 100 grams up to 97.9 milligrams per 100 grams. Black carrots originate from Turkey, the Middle East, and Far East. Carrot is rich in pro-healthy antioxidants both of lipophylic (carotenoids) and hydrophilic (phenolic compounds) characters. Although carotenoid content varies considerably among carrot genotypes, usually orange carrots contain high amounts of α- and β- carotene; yellow carrots contain lutein, the red color of carrots is due to lycopene, while polyphenol substances, mostly anthocyanins are typical for purple roots. Genetecists have shown with genetical data that the cultivated carrot germplasm is subdivided between Eastern and Western carrots (Clotault et al. 2010). The black/purple carrots are clustered in the Eastern group, even if three individuals from the Middle East show admixture between the two geographical groups. This suggests the black type has an oriental origin, and that gene flows between this type and European carrots may have arisen in Turkey/Syria. Carrots of Asian origin belonging to Eastern gene pool are more often purple or red and richer in phenolics and have higher antiradical activity than those from the Western gene pool with mainly orange roots. Evidence from new research suggests that eating black carrots on a regular basis could have positive benefits in reducing the risk of neurological diseases such as Alzheimer's. A number of components in black carrots including its anti-inflammatory properties and anthocyanin can play an important role in treating these conditions. The research is not yet conclusive but it's a big step towards understanding Alzheimer's as well as its potential natural treatments. Black carrots are a popular vegetable in India and China. This vegetable is loaded with nutrients that offer numerous health benefits. 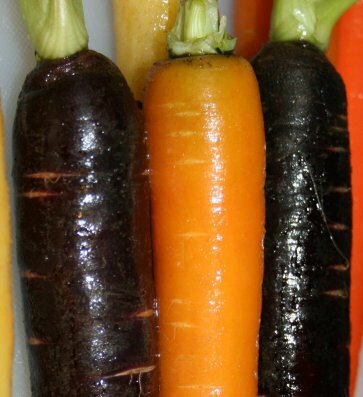 Rich in nutrients, black carrots get their colour from anthocyanins. These carrots help in providing relief from inflammatory disease, treating digestive issues like constipation, boost cognition, bloating, cough, weakness in joints and cramps. Black carrots are extremely high in dietary fibre which can help to stimulate peristaltic motion, improves the nutrient absorption in the gut and helps smoothen the bowel movements. Its helps as fibre can help in quick weight loss and lower cholesterol levels. Dietary fibre also regulates the release of insulin and glucose in the body, which makes it an excellent choice for diabetics. Wild carrot has a small, tough pale fleshed bitter white root; modern domestic carrot has a swollen, juice sweet root, usually orange. Carrots originated in present day Afghanistan about 5000 years ago, probably originally as a purple or yellow root. Nature then took a hand and produced mutants and natural hybrids, crossing both with cultivated and wild varieties. It is considered that purple carrots were then taken westwards where it is thought yellow mutants and wild forms crossed to produce orange. Finally some motivated European (perhaps Dutch) growers took these mutant orange carrots under their horticultural wings and developed them to be sweeter and more practical. 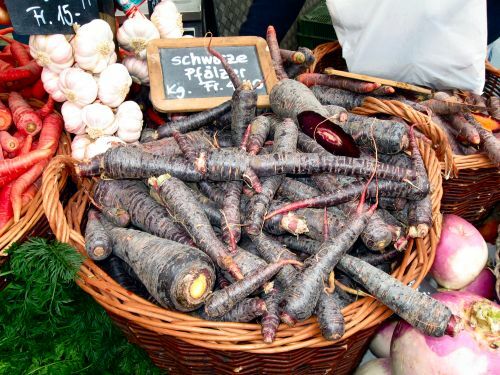 Black carrots are more weather sensitive and it is suspected that they did not "travel" well to the colder parts of western Europe. Even today growing black carrots in the West can be problematic and they often bolt in the first year, producing spindly roots and no flowers, or at the best very weak ones. In the Roman period carrots were purple or white. 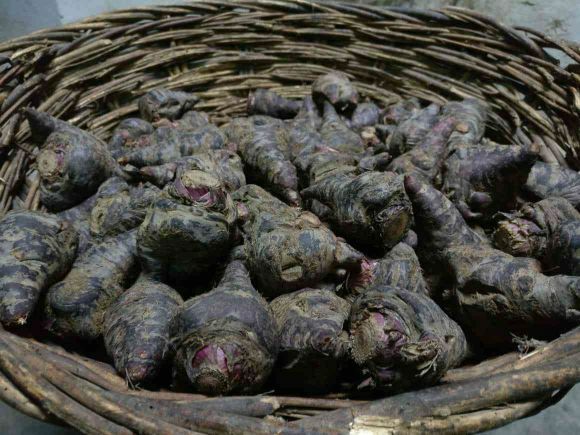 By the 10th century purple carrots were grown in Af ghanistan, Pakistan and northern Iran. Purple, white and yellow carrots were imported to southern Europe in the 14th century. Black, red and white carrots were also grown. Black Carrots contain anthocyanins, part of the flavonoid family with antioxidant properties. Flavanoids are currently under investigation as anticancer compounds, as free radical scavengers in living systems, as well as inhibitors of LDL (the bad) cholesterol and the black carrot anthocyanins are especially active. It has anti-bacterial and anti-fungicidal properties and oil made from its seed can help control scalp itchiness and provides essential nutrients for hair growth. 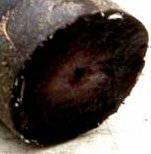 The ancient black carrot has been making a comeback, not so much for culinary purposes but as a source of natural food colorants. These originate from Turkey, and the Middle and Far East. The anthocyanins in black carrot extract provide many health benefits, several from its antioxidant properties. Research in the March 2011 issue of the "Journal of Agricultural and Food Chemistry" notes a correlation between anthocyanins and the potential for treating neurological dysfunctions such as Alzheimer's disease. Anthocyanins may also be useful in cancer treatment -- evidence published in the May 2011 "Molecular Nutrition and Food Research" journal indicates that anthocyanins may counteract toxins that can damage healthy cells during chemotherapy. Read more about the Black Carrot food colouring here. Francisco Martinez Montino. His original manuscript dates from 1623. Montino was a cook to 3 Kings - Philip II, Philip III and Philip IV. The book gives an insight into royal banquets of the day with the description of elaborate recipes. "The carrot for salad you should look for the black ones, wash them, and clean off the rootlets, and cut the point and the tops, and put them in a pot, and press them to the bottom so they are very tight, and place the pot n the coals and put fire all around, and above and roast them very well. Then take out and clean off the skin so they become very delicate and season with salt and serve with oil, vinegar while hot. And if you want to add sugar, you can. The should be shallow. You should set these carrots where there are coals, and make little slices." (Note the word “salad” merely means that this is a dish composed solely of vegetables, but not necessarily that it is cold). Kanji and Salgam are popular drinks made from black carrots. (photos below) They are highly nutritious and have a high iron and vitamin content,. very good for the stomach. Regular intake gives a glow to the complexion. 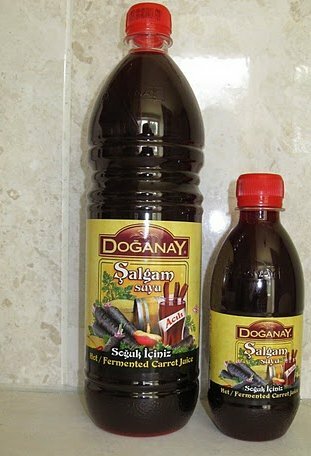 (Note - The ş in Turkish is sh; it is spelt şalgam it would phonetically be pronounced shalgum in English.) Black juice recipe here. Halva recipe here. Black carrot juice is appetizing, good for the digestion and includes vitamins B and C. It is also good for liver and stomach. It includes other nutrients like calcium, potassium and iron which are beneficial for strong bones and teeth. The drink is also an excellent blood cleanser. It helps in maintaining eye health and blood circulation. In addition, it helps in keeping the skin healthy and gives it a smooth texture. Kanji is very easy to prepare. Take five to six black carrots. Wash and clean them thoroughly. Then, chop them into pieces. Take three table spoons of rai powder, two tea spoons of salt and two tea spoons of ginger powder. Mix the contents and put into a large glass jar and pour six to seven glasses of water into it. Let it stand in sun for two days. Strain the contents and kanji is ready for consumption. In summer you can chill this delicious drink and serve with ice cubes. Garnish with fresh coriander leaves and finely chopped ginger. Gajar Kanji or carrot kanji is a traditional punjabi fermented drink that is made in the winters. 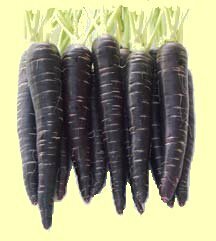 black carrots appear in the winters in north India and these give the kanji its characteristic purple colour. if you don’t have black carrots, then adding beetroot gives this rich dark purple colour. the kanji is made with simple ingredients – carrots, mustard powder, red chilli powder and black salt along with water. Black carrots grow mostly in southern Europe and Asia, principally in Turkey and India. The pigments that give black carr ots their characteristic colour are anthocyanins. These pigments exhibit a reversible change in molecular structure as the pH of solutions change from acidic to basic. This change in structure is characterized by a shift in hue from red to purple to blue as the pH changes from acidic to basic. Advantages: Anthocyanins from purple carrot are more stable over a wider pH range than anthocyanins from other fruit or vegetable sources, making them ideal for use in yogurts and other low pH dairy products. Recommended applications: Flavouring, Energy Drinks, Spirits, Juice Drinks, Specialty Tea, Yogurt, Smoothies, Fruit Preparations, Salad Dressing, Breakfast Cereal, Confections, Dry Mixes. Black carrot can be eaten raw and makes an ideal ingredient for fresh salad. Cut long pieces of black carrot, red carrot and radish. Chop tomatoes and boiled potato and mix in a bowl. Add salt, lemon juice and green chillies to taste. 1 - Black Carrot Juice Concentrate includes over 12 times more antioxidant in comparison with regular carrot concentrate. 2 - It is stable through change in temperature and pH. it can be used as colour additive for various food directly without any additional procedure. 3 - Black Carrot Juice Concentrate added to strawberry marmalades help to keep their natural colour more steady. 9 - Black Carrot Juice Concentrate is appetising, good for digestion, includes vitamin B which is a tranquilizer, Good for liver and stomach, includes calcium, potassium and iron which are good for bones and teeth, includes vitamin A-B-C which are good for the heart, eyes and blood vessels. 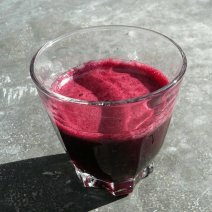 Black Carrot Juice is an excellent blood cleanser. It has a high content of iron and vitamin C. It helps maintain eye health and blood circulation. It is good for constipation, stomach disorders and makes the skin healthy and glowing. Owing to its highly fibrous nature, it keeps the alimentary canal clean and regulated. It acts as a moistening agent and tones up the skin. It is good for treating acne and pigmentation. Extracts from black carrots are most often used as a natural food colouring. The extract's colour is similar to that of grape skin extract -- red-blue or magenta. Food manufacturers may prefer black carrot extract to grape juice concentrate or grape skin extract because it is kosher and the colour from black carrot extract retains its colour better. The reddish colour of black carrot extract is a natural alternative to synthetic food colorings such as FD&C Red 40, or a colouring made of insects, called carmine. 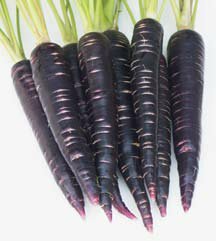 Unlike "normal" carrots, which owe their color to their Carotene content, Black Carrots contain Anthocyanin compounds (primarily Cyanidin glycosides) which, after extraction, exhibit desirable red shades similar to FD&C Red 40. 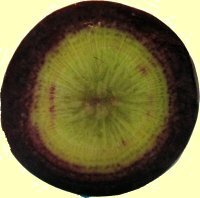 More stable than other anthocyanins, Black Carrot Extra ct Colour is most stable and intense in the pH range of 3.0 to 5.0. This makes it ideal as a red colouring for water-based, low-pH systems such as beverages, sherbets, yogurts, candies and confections. Typical use levels are in the 0.01 – 0.50% range. Black Carrot Extract Colour is available in both dry and liquid form. Black Carrot Concentrate is a Natural Food Additive which enables pink to red - red to purple color shades according to pH of the added product. This recipe is a bit off the beaten path, but definitely worth a try if you can get your hands on some healthy and flavonoid rich ripe black carrots. If you can't find them at your regular produce vendor then try a Middle Eastern or Turkish specialty shop. To begin this recipe you will first need to take out your juicer and plug it in. Give the juicer a quick once over to make sure it's clean and sterile. Next up thoroughly wash and rinse your black carrots under cold running tap water. Depending on the size and processing strength of your juicer, you many need to quarter your carrots to prevent over stressing your machine. Moving forward, place a tall glass under the juice spout and begin feeding the carrots into the machine one by one. Depending on the moisture content of the carrots, you may need to adjust your carrot proportions accordingly. As an optional garnish add one freshly cut lemon wedge to your glass. One glass per day is the recommended limit, consumed either during or after a meal. Method: Grate black carrots and put them in a pan. Add milk and cook till soft. Add sugar and cardamom powder. Cook well. Add milkmaid to this mixture. Fry pistachios and cashew nuts in ghee and add to the mixture. Mix well and cook till ghee leaves the sides of the pan. Tasty Black Carrot Halwa is ready and it can be either served hot or chilled. I have never found a source of black carrot seeds in the US, but you could try some of the seed exchange organisations. This site at Territorial Seeds has some very dark purple. You could also try Black Knight, which are available in the US (Amazon of all places!). Not a true black but more reliable and some of the darker ones which appear are almost black. I consider these to be true blacks in any case, because they have the white/purple core. Most ordinary purples (purple haze etc) are orange centred. 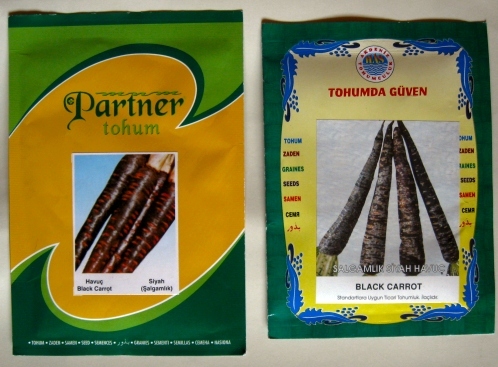 I have previously purchased Spanish Black carrot from Thomas Etty in the UK, and I know they post to US. You could also try some of the seed suppliers listed at USDA here. Please be aware the Spanish Black (and other darks) are VERY erratic and often do not germinate or if they do they bolt to flower in the first year, producing a spindly wild carrot-type root. Of course they originate from Turkey/Syria and therefore grow best in the environmental conditions found there. UK conditions are very similar to NYC and nothing like Turkey! The “Journal of Agricultural and Food Chemistry” published a study in April 2011 that investigated the anthocyanin content in four varieties of black carrots including the Antonina, Beta Sweet, Deep Purple and Purple Haze and found a range of anthocyanin levels, from 1.5 milligrams per 100 grams up to 97.9 milligrams per 100 grams. Cured, fermented and smoked foods : proceedings of the Oxford Symposium on Food and Cookery 2010 - Elizabeth Field: Marmal;ade's dual role as a Medicine and a Preserve.